Hundreds of U.S. radio stations are playing wall-to-wall holiday music as Christmas approaches. The moves continue to pay off for the stations that swap their format for "all-holiday" music, particularly for Adult Contemporary. 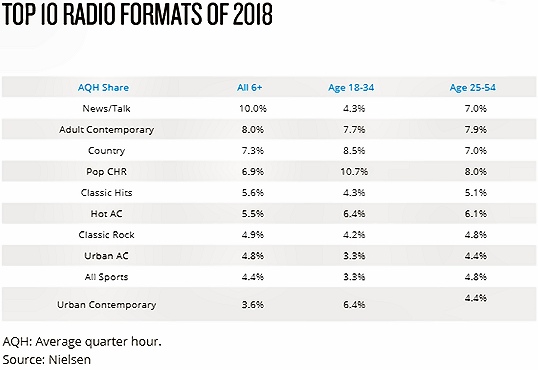 But, News/Talk radio continues to be the number one format for the eight year in a row across PPM markets, ages 6+, followed by AC and Country. 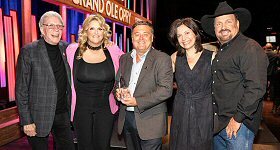 It was one of four formats that increased its share over last year (News/Talk was up 10% from 9.9% in 2017). The interest in news and politics remains exceptionally strong several years removed from the last U.S. presidential election. In 2018, midterms, Supreme Court nominations, natural disasters, social media scrutiny and widening cultural debates (among other stories) continued to drive listeners to the News/Talk format. Elsewhere, Adult Contemporary increased from 7.7% to 8.0%, Classic Hits trended from 5.3% to 5.6% in 2018 while also having another big summer, and All Sports moved slightly higher in 2018, growing from 4.3% last year to 4.4% this year.